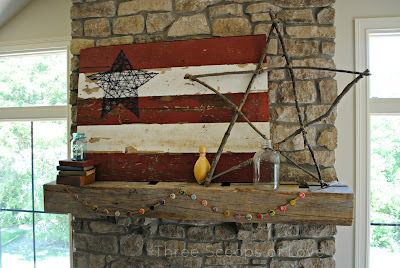 Yesterday, I shared my Fourth of July decorated mantel with you. After adding the barnwood American flag, branch star, and accessories, I wanted a little bit more color. 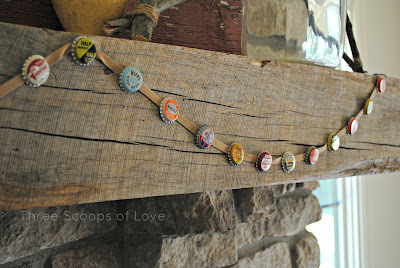 I decided on a small bunting for the front of the mantel made out of vintage bottlecaps. A few weeks ago, I was explaining to my girls about how drinks used to come in glass bottles, not cans. That got me thinking about all of the different types of soda of years past. 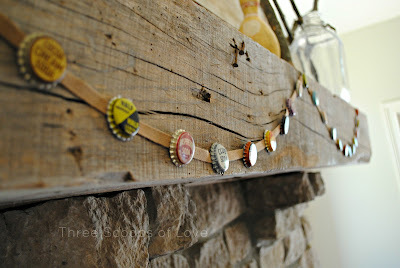 A cold glass bottle of fizzy soda just feels like a hot summer day, so I started looking around for some bottlecaps. Apparently, they can be quite collectable. I found mine on ebay through this seller. They were all unused and most had a cork liner in the cap. I wasn't interested in their collectable value, I was just looking for some fun colors and typography styles. I bought a length of twill tape at the fabric store and hot glued my bottlecaps on to make the bunting. Super simple. You could really take this idea and go a lot of different directions. 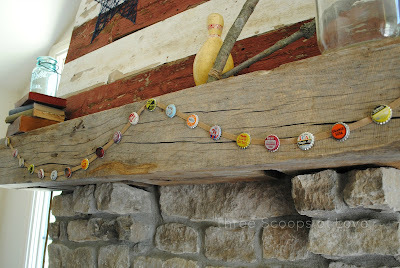 Maybe for an older person's birthday you could use bottlecaps that would have been popular during his or her youth. I could see making one for my husband with his favorite kinds of beer. If I had thought of it sooner, I would have used the idea for my sister-in-law's POP themed baby shower. Hmm, I bet I'll be making more versions of this one in the future.